2010 WTA Championship in Doha looks like a competition not only among tennis players, but among brands which each of them represents. At least this year all of the 8 best of the best represent different brands. So I decided to rank them according to my liking. Lets see who wins. 8. The last place goes to Yonex. It seems that something is always wrong with their clothing. When they don't miss with the color, they miss with shape. Still can't get why they made this dress so wide on a waist. 7. 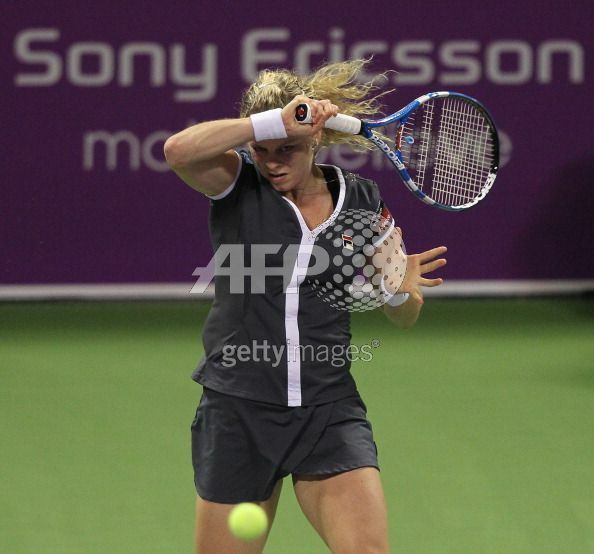 Fila's style this time is not much better, even awesome play of Kim Clijsters doesn't help it. 6. Italian Lotto brand worn by Francesca Schiavone, is rather classy, nothing too fancy, but not too bad. 5. Lacoste. 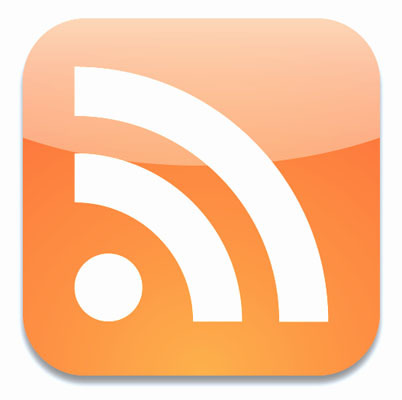 Nice color, a bit conservative design, but some may like it. 4. Is purple a hip color? Considering that it's also worn by Vera Zvonareva, may be. KSwiss clothing with rather interesting back strap is on the fourth place. 3. I hate to put Nike (which is personally my favorite brand) on the third place, but Victoria Azarenka's choice makes me do so. 2. Hard choice... But I have to give second place to Adidas by Stella McCartney. Though Caroline Wozniacki would be great in any dress. Some general tips for nutrition and diet for athletes, and same will apply for people who want to lose weight. This will NOT apply to weight lifters and those who want to gain mass and muscle. - Never workout less than 1.5 hours after eating a regular meal, and 30 minutes after eating a snack, unless it is a small fruit or part of a bar. - The younger you are, the more protein you will need because your bones are still growing as well as other body parts. Add more portions of low fat milk, dairy products, and other sources od lean protein. Egg whites are the most perfect forms of protein for the human body. 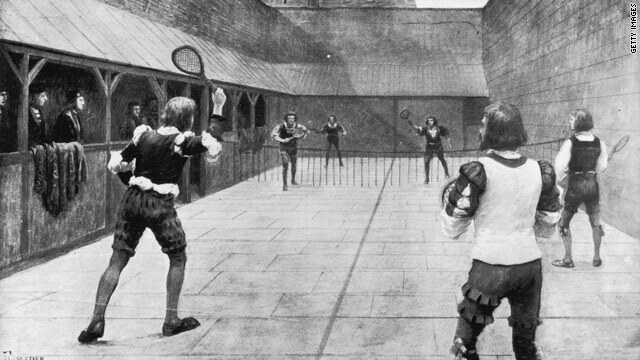 King Henry VIII builds a tennis court at Hampton Court Palace and commissions suits—most likely “tall stockings, short blist’red breeches,” as in Shakespeare’s Henry VIII—for the ensuing matches. A sturdy canvas and rubber shoe called a croquet sandal is introduced and sells for six dollars a pair, making it too expensive for all but the very wealthy. The shoe later became known as the tennis shoe. The original sneaker offers players a solution to unsightly grass stains. Women dress in aristocratic style—ground-grazing skirts with voluminous bustles, corsets, high necklines, and floppy hats. The game is rechristened “pat ball” as women gingerly tap the ball over the net. 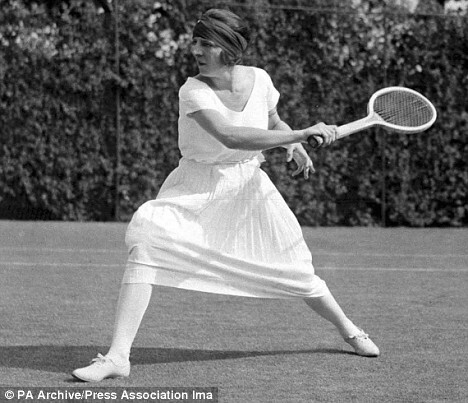 Suzanne Lenglen wins Wimbledon in a knee-length dress with three-quarter sleeves and a widely imitated bandeau. (Women reportedly walk out, calling the display “shocking.”) Suzanne was the first woman to play without a corset under her tennis dress. 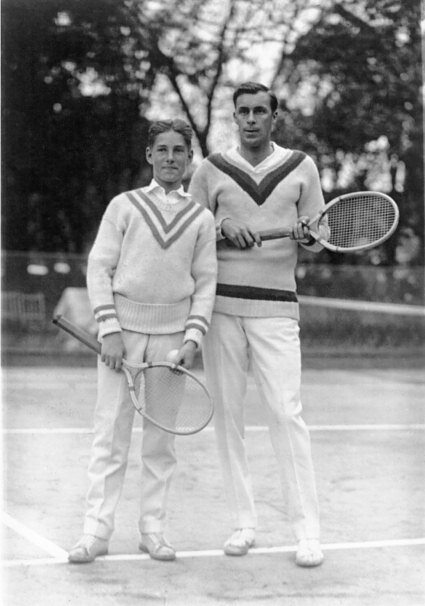 Big Bill Tilden ushers in the golden age of tennis sporting a preppy array of cable knits and V-neck sweaters. René Lacoste earns the nickname “the Crocodile” after he makes a pre-match bet over a crocodile-skin suitcase. He later has a croc emblem embroidered onto his shirts and blazers. Helen Jacobs at Wimbledon, 1933. “Gorgeous” Gussy Moran asked the Wimbledon organizers if she could wear colored clothing. Her request was turned down, so tennis fashion designer Ted Tinling created a dress incorporating lace-trimmed knickers which even triggered a debate in parliament. Photographers lie flat on the ground in order to shoot her knickers. Karol Fageros was raising eyebrows at the All England Club - with her gold lame underpants. She was immediately kicked out of the tournament, but earned a reprieve when she agreed to cover up her sparkly undies with some more demure white lace. Arthur Ashe wins the first U.S. Open sporting an ahead-of-its-time hipster ensemble: short shorts and bookish black-rimmed glasses. Television viewers complain that they can’t tell the players apart in their all-white suits. For the first time, the U.S. Open permits pastel. 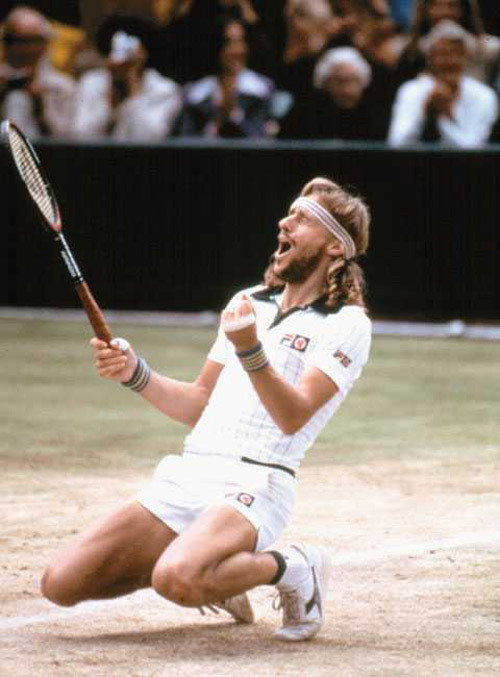 Sweatband-wearing Swedish heartthrob Björn Borg takes the first of five consecutive Wimbledons. Later, he founds a clothing line known for its boldly patterned underwear. 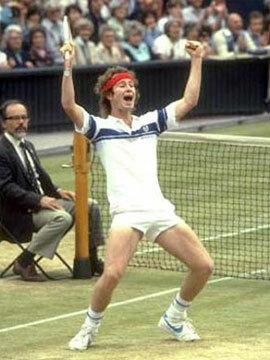 An unusually festive John McEnroe wins his first Wimbledon singles title on the Fourth of July wearing a blue-and-white striped polo shirt, matching tube socks, and a red sweatband. Leggy blonde Anne White takes the court at Wimbledon in a curve-hugging white unitard, distracting her opponent, Pam Shriver. Though the attire satisfies requirements, officials request that she dress more traditionally the following day. 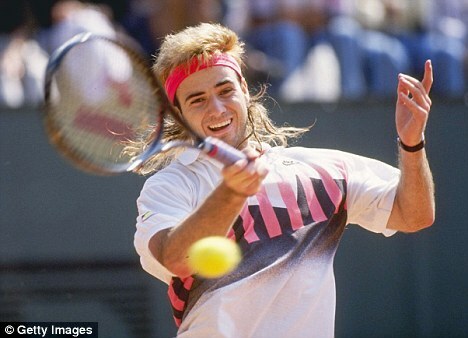 Andre Agassi plays the French Open in hot pink. The tournament’s director says he might institute a white-clothing rule. Agassi calls him a “bozo” and segues, briefly, into a lime-green phase. 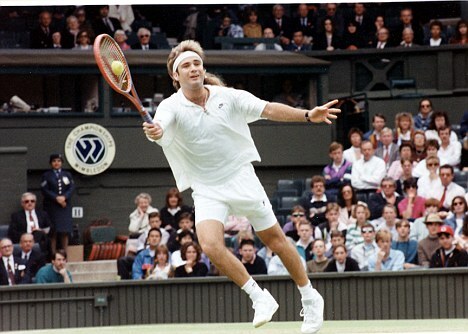 In a hotly anticipated moment, Agassi removes his warm-up suit at Wimbledon to reveal an all-white ensemble, with white Lycra shorts peeking out from under white denim; the crowd erupts in applause. Bethanie Mattek arrives at the U.S. Open poured into a formfitting leopard-print ensemble. She loses, but continues to dress for future Opens as though attending a Halloween party. Maria Sharapova fails to defend her U.S. Open title despite wearing a Nike dress encrusted with 600 Swarovski crystals, inspired by the Manhattan skyline. The bright red-flame color represents the Big Apple. 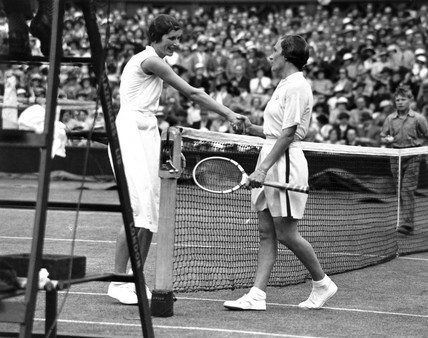 Tatiana Golovin became the forth woman (after Gussie Moran, Karol Fageros and Anne White) who shocked British public, as she broke the rule of "mainly white" Wimbeldon dress code by wearing red knickers. Venus Williams has been constantly raising eyebrows by wearing skin-colored hotpants during Australian Open, then wearing the same hotpants with the dress which according to Examiner.com "better suited for a dancer at the Moulin Rouge", and choosing to wear form-fitting pink, sequined dress with matching bedazzled shorts during the US Open. Used info from http://nymag.com/fashion/08/fall/49260/ and www.mirror.co.uk pictures from different sources from the web.